Icron’s Turnkey solutions are complete USB extension solutions without enclosures. With the Turnkey systems, OEM customers can quickly and easily embed ExtremeUSB® into their end applications or custom enclosures. The USB 2.0 RG2301 Series Turnkey is a single-port extender solution available in point-to-point or LAN based extender system configurations, featuring full device and host support. The 2301 turnkey model extends USB over a point-to-point CAT X connection, the 2301N turnkey model extends USB over Ethernet, the 2301GE-LAN Turnkey model also supports SwitchableUSBTM and Device Class Filtering, whereas the 2301S Turnkey model additionally supports the Simultaneous Users Interaction feature. Other advanced OEM features available include Hot Key support and Vendor Lock. To find out more about shared and unique turnkey features, simply click on the Features tab below. The USB 2.0 RG2301 Series Turnkey consisting of point-to-point and network variants, are sold separately as printed circuit boards in Local Extender and Remote Extender configurations for easy integration into a custom enclosure. OEM customers can choose from four variants. The USB 2.0 RG2301 Turnkey allows users to extend USB 2.0/1.1 connections over a single CAT 5e/6/7 cable up to 100m in point-to-point fashion. The USB 2.0 RG2301N Turnkey allows users to extend USB 2.0/1.1 connections over a GigE LAN or single CAT 5e/6/7 cable up to 100m in point-to-point fashion. Extending over LAN saves on installation time and provides IT visibility. In addition to LAN connectivity, the USB 2.0 RG2301GE-LAN Turnkey supports Device Class Filtering and Icron’s SwitchableUSB protocol for dynamic switching of Local to Remote Extender pairings. The 2301S Turnkey additionally supports Simultaneous Users Interaction feature which extends up to seven different Remote Extenders from the same Local Extender across the LAN. The OEM 1-port USB 2.0 Series Turnkey supports data rates at up to 480Mbps and is plug and play – no software drivers required – for all major operating systems: Windows®, macOSTM, and Linux®. Additionally, this ExtremeUSB® based solution is FCC/CE Class B certified (compliance tested in RG2301 enclosure with Icron Power Adapter) and is ideal for use with all USB peripherals including: keyboards, mice, interactive white boards, flash drives, hard drives, audio devices, web cameras and any other USB 2.0 or 1.1 device. Product is sold as Local or Remote Extender PCBA and regional power cords and 5V 3A power adapters may be purchased separately. 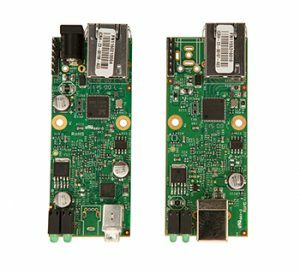 The USB 2.0 RG2301 Series Turnkey is sold as either a Local Extender PCBA or Remote Extender PCBA and includes a 2-year warranty. 5V 3A power supplies and country specific power cords are available for purchase as accessories. Diagram below shows a LAN application with Local and Remote PCBA inside black enclosures.